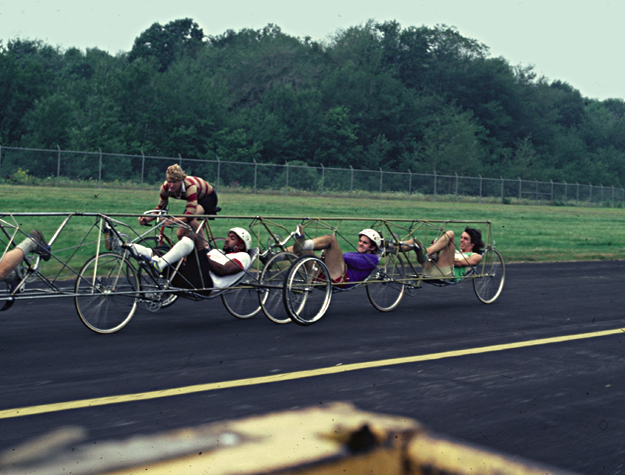 Group Velocity was a 4-person cycle – designed and built to break the human-powered land speed record. The project was the pursuit of a small cadre of dedicated students from various departments at MIT. Assaults on the land speed record are dominated by aerodynamics and available power – efficient shapes with powerful riders hold the records. Some simple analysis identified that solo and tandem human powered cycles were approaching a theoretical limiting speed, governed by the horsepower that a person could generate and the minimal area that a pedaling human could occupy. Group Velocity took a step back and realized that, if additional people were added in line behind a lead rider in a single vehicle, more power could be supplied without significantly increasing frontal area or total drag. Doing this while keeping the recumbent rider position which was proving itself to be the winner in solo human-powered vehicles can be a real nightmare in terms of getting power from the riders to the road. The second "Ah-Ha" in the vehicle's design was the realization that land-locking the wheels was adequate for letting the riders get power to the ground – the riders didn't need to have their drivetrains combined, as long as their drive wheel was on the ground and sufficiently weighted. The completed machine proved to be a very good vehicle. In unfaired testing, with ordinary riders (author included (I'm hardly a "powerful" cyclist)) it was effortless to get the machine up to 45mph and beyond - speeds that no single rider could match. Later tests with a non-rigid fairing showed that further gains were lurking in aerodynamic improvements. Unfortunately, vehicle completion was stalled by political battles with another vehicle design for the remaining construction funds (despite the other design never having completed a prototype, nor having participated in the promised winner-take-all roll-off between the two designs). Had we been able to complete the rigid fairing and take it to the HPVA Championships in California (Nevada, these days), we would've been contenders.